Streamlight Fire Vulcan LED is an ultra lightweight rechargeable lantern style light with a 1,856 foot beam range. 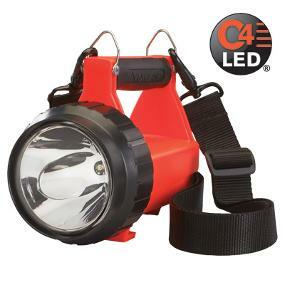 It has all of the cutting edge features you are looking for in a handheld searchlight including lightweight lithium-ion rechargeable battery, 8 programmable functions, C4 LED technology, up to 3 hours runtime in high, taillight LEDs (for rear visibility) and a quick release shoulder strap. C4 LED technology and a special reflector make the Streamlight Fire Vulcan LED 5 times brighter than other comparable models. With a lithium-ion battery, it’s super lightweight, too – weighs only 1.85 pounds. The Fire Vulcan LED is a rechargeable, waterproof lantern featuring the latest in power LED technology for extreme brightness. Lithium-Ion nanotechnology batteries make it the lightest weight lantern in its category. The life-saving tail lights are just part of what makes the rechargeable Fire Vulcan LED such a critical firefighting tool. It’s lighter too, about 45-percent lighter than the halogen Fire Vulcan. The easy to operate toggle switch provides programmable access to various modes of operation. Brighter, lighter and smarter, the Fire Vulcan LED features revolutionary C4 technology combined with an innovative Streamlight-engineered reflector, providing sharp and focused light that rivals incandescent intensity without giving up the durability and longevity of an LED. The Fire Vulcan LED Lantern features C4 LED technology, impervious to shock with a 50,000 hour lifetime. A deep-dish parabolic reflector produces a tight beam with optimum peripheral illumination to aid in navigation and optimized electronics provide regulated intensity. Use the push and hold momentary toggle switch to access eight modes of operation. The C4 LED provides 80,000 candela peak beam intensity and 145 lumens on High modes, and provides 40,000 candela peak beam intensity and 70 lumens on Low modes. Ultra-bright blue tail light LEDs make certain you can be seen even in thick smoke. 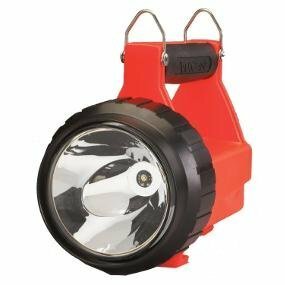 Designed for durability, the Fire Vulcan LED Lantern features a high impact ABS thermoplastic housing with a rubberized cushioned-grip handle and reinforced D-rings. Its unbreakable polycarbonate lens has a scratch-resistant coating and is O-ring sealed. IPX7 rated waterproof at 1-meter for 30 minutes and so light in weight, the Fire Vulcan LED lantern floats! 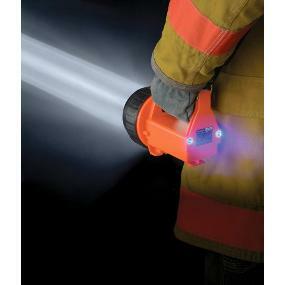 Ultra lightweight, the Fire Vulcan LED weighs only 1.85 pounds (with batteries). 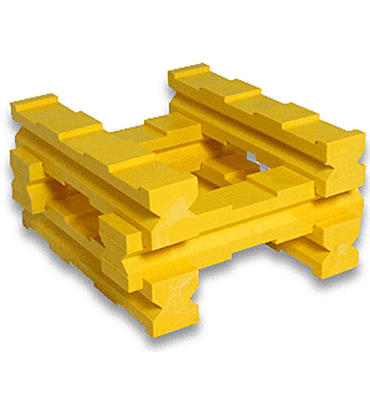 It measures 7.5 inches in length, has a width of 5 inches and a height of 6.5 inches. Fire Vulcan rechargeable lantern flashlight Stream light fire Vulcan 44454 rechargeable lantern flashlight C4 LED camping lights flashlights. The Fire Vulcan LED is a rechargeable, waterproof lantern featuring the latest in power LED technology for extreme brightness. Lithium-Ion nanotechnology batteries make it the lightest weight lantern in its category. The life-saving tail lights are just part of what makes the rechargeable Fire Vulcan LED such a critical firefighting tool. It’s lighter too, about 45 percent lighter than the halogen Fire Vulcan. The easy to operate toggle switch provides programmable access to various modes of operation. Brighter, lighter and smarter, the Fire Vulcan LED features revolutionary C4 technology combined with an innovative Streamlight-engineered reflector, providing sharp and focused light that rivals incandescent intensity without giving up the durability and longevity of an LED. Market applications include, but are not limited to, fire and rescue, industrial safety, utilities, emergency medical services, home use and pest control. Left Modes: Steady High LED/Steady tail lights; Steady Low LED/Steady tail lights; Steady High LED/No tail lights; No LED/Steady tail lights. Right Modes: Steady High LED/Blinking tail lights; Steady Low LED/Blinking tail lights; Blinking High LED/No tail lights; No LED/Blinking tail lights. Eight modes of operation produce various run times, depending on a chosen mode. Steady High LED and tail lights: Up to 3 hours of run time. Steady Low LED and tail lights: Up to 7 hours of run time. Steady High LED only: Up to 3.5 hours of run time. Blinking High LED only: Up to 5 hours of run time. Blinking tail lights only: Up to 20 hours of run time. The Fire Vulcan LED is a rechargeable, waterproof lantern featuring the latest in power LED technology for extreme brightness. Lithium-Ion nanotechnology batteries make it the lightest weight lantern in its category. The life-saving tail lights are just part of what makes the rechargeable Fire Vulcan LED such a critical firefighting tool. The easy to operate toggle switch provides programmable access to various modes of operation. Brighter, lighter and smarter, the Fire Vulcan LED features revolutionary C4 technology combined with an innovative Streamlight-engineered reflector, providing sharp and focused light that rivals incandescent intensity without giving up the durability and longevity of an LED. The Fire Vulcan LED Lantern features C4 LED technology, impervious to shock with a 50,000 hour lifetime. A deep-dish parabolic reflector produces a tight beam with optimum peripheral illumination to aid in navigation and optimized electronics provide regulated intensity. Use the push and hold momentary toggle switch to access eight modes of operation. The C4 LED provides 80,000 candela peak beam intensity and 145 lumens on High modes, and provides 40,000 candela peak beam intensity and 70 lumens on Low modes. Ultra-bright blue tail light LEDs make certain you can be seen even in thick smoke. Powered by two lightweight lithium ion nanotechnology battery cells, the Fire Vulcan LED fully recharges in 5 hours. Eight modes of operation produce various run times, depending on a chosen mode. Steady High LED and tail lights: Up to 3 hours of run time. Steady Low LED and tail lights: Up to 7 hours of run time. Steady High LED only: Up to 3.5 hours of run time. Blinking High LED only: Up to 5 hours of run time. Blinking tail lights only: Up to 20 hours of run time. Designed for durability, the Fire Vulcan LED features a high impact ABS thermoplastic housing with a rubberized cushioned-grip handle and reinforced D-rings. Its unbreakable polycarbonate lens has a scratch-resistant coating and is O-ring sealed. 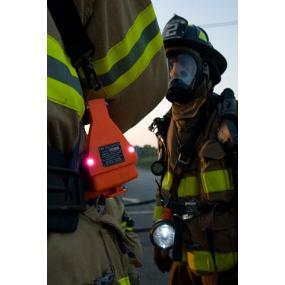 IPX7 rated waterproof at 1-meter for 30 minutes and so light in weight, the Fire Vulcan Lantern floats! Ultra lightweight, the Fire Vulcan LED Lantern weighs only 1.85 pounds (with batteries). 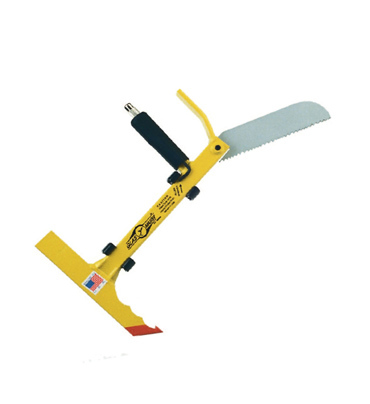 It measures 7.5 inches in length, has a width of 5 inches and a height of 6.5 inches.